Brunswick Machine Knitting Novices: I found it! I thought that this photo had mysteriously vanished from my files. I'm so happy to have found my favourite machine knit group project. And a Southern hemisphere festive icon. It was displayed at the last MKAV Seminar, in the Club Projects competition. (yes, there is another coming up. and the Brunswick club can put in our own entry if we are strong enough) Due to the tyranny of democracy it did not win the popular vote - the display from the largest club took out that honour. The numerically strong and stylistically daring Moonee Ponds group might have taken the popular vote with Barbie and Ken and friends all kitted out in winter woollies, frolicing in the snow, except that it is known that several members gave their votes to the penguins. 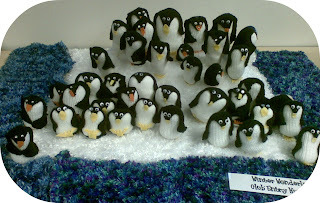 If anyone wants to worry about whether machine knitting counts as hand made, just consider these penguins. All made from the same pattern, by different knitters on different machines, using whatever scraps of suitably coloured yarn came to hand. Each penguin a distinctive character. Made by the knitters in Elaine's East Malvern club, concept developed by Joan. Eeep! Too cute! I love this little diarama, showing as it does the individual nature of all creative efforts, machine or no. Plus, you know, who doesn't love a penguin?